Diode Light Therapy is an anti-ageing, rejuvenating and healing treatment which harnesses the positive effects of both red and blue light, with the goal of replenishing and repairing skin cells. The Rejuvalight system consists of many tiny, individual red and blue emitting diodes which are shone directly onto the face or body. This may help to tone and plump the skin, kill bacteria and promote cellular growth. The red and blue lights have different effects on the skin. Blue Light wavelengths may destroy bacterial cells in sweat pores and glands. This surface cleansing may assist the skin to recover from the acne infection. Red Light wavelengths can penetrate more deeply than blue light. They may stimulate the skin to help rejuvenate and develop more collagen fibres, which may improve elasticity, diminish fine lines and wrinkles and assist the repair of damaged skin cells. The red and blue lights can be used individually or combined, depending on the condition of the skin being treated. A course of chemical skin peels or microdermabrasion may also be advantageous following a course of Rejuvalight. Acne often responds very well to Rejuvalight, with many patients seeing an improvement in moderate acne after eight thirty minute sessions. How long does the treatment take and how many sessions will require? Treatments will take approximately thirty minutes twice a week. Q. Is RejuvaLight Diode Light Therapy painful? No, the treatment is non-invasive and no direct contact is made with the skin. The RejuvaLight treatment is regarded as a pleasant, relaxing experience. Q Are there any side effects associated with RejuvaLight Diode Light Therapy? Clients must wear protective eye-wear during the treatment against high intensity diode light. 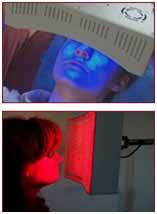 Red and blue light wavelength exposure on the skin for the treatment time we recommend has no side effects. Many patients notice an improvement in the overall tone of the skin from the very first treatment, but conditions such as acne and wrinkles may take a longer time to see improvement. A short course of typically six to eight treatments are usually recommended to achieve the desired results. Monthly maintenance visits are generally recommended to maintain results. Prices from £50.00 per treatment for a course of six to eight sessions. Prices are from £50.00 per treatment for a course of six to eight sessions, for more information please contact us on 0845 603 6150. Solihull Medical Cosmetic Clinic are proud to be one of the first clinics in the Midlands to offer a new lip and eye rejuvenating peel refresh rejuvenate and reverse the ageing effects on the eyes and lips. Having treated many satisfied clients from all over the UK we have incorporated this treatment in to the eye repair and rejuvenate programme of treatments we offer . The areas of the face which show our age the most are the peri-ocular (around the eyes) and peri-orbital areas (around the lips). The eye and lip peel is a gel-based skin remodelling solution that is especially designed for these sensitive areas including darker skin types . Disclaimer: Please note that treatment results will vary from individual to individual. The eye and lip peel is a gel-based skin remodeling solution especially designed to target around the eye and lip area. It targets Fine Lines close to the eye, Crows Feet – which we all know and hate, pigmentation build up below and eye or on the eye lid, pout lines and Melanin moustache from using hair removal. 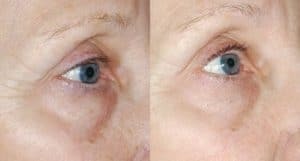 Eye and Lip is a noninvasive and trouble free treatment has little to no downtime, which essentially means you are free to carry on with your daily routine without having to hide away. You can even fit a treatment in during lunchtime.